In a first, 24 researchers from several labs have designed and synthesised ‘Disarib’, a drug which induces the death of cancer cells. Dr Sathees Raghavan and his team of researchers at Department of Biochemistry, Indian Institute of Science, Bengaluru. Cancer biologists, chemists, clinicians, and specialists in bioinformatics, belonging to different labs, will soon pool their expertise for a multi-crore rupee project aptly titled ‘Glue Grant’, to carry out pre-clinical tests of the drug Disarib which brings about the death of cancer cells. The Department of Biotechnology (DBT), New Delhi, has approved this collaborative effort to produce the first home-grown drug, which has been found to be better than the one (Codenamed ABT199) approved by the Food and Drug Administration (FDA) of the United States, for it does not set off any side effects. Designed and synthesised by researchers from eight different research groups spread over labs in Mumbai, Thiruvananthapuram, Bengaluru, and with contributions from a couple of Indian scientists at the Department of Molecular and Clinical Cancer Medicine, University of Liverpool, Disarib belongs to the class of “designer molecules” that zero in on rogue cells as part of the targeted therapy method to combat cancer. To start with, the efficacy will be checked out on cancer cells of patients suffering from leukaemia and lymphoma. 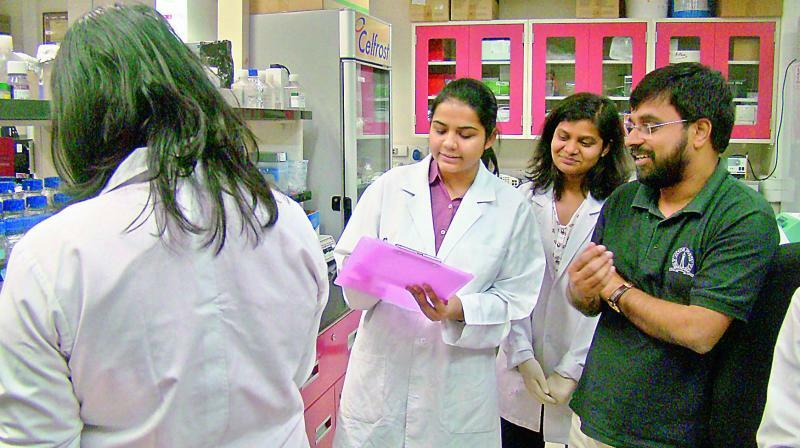 Besides Disarib, new drugs with similar action against cancer cells will be tested for toxicity and efficacy as part of the new project, says Prof. Sathees Raghavan of the Department of Biochemistry, Indian Institute of Science, Bengaluru. Prof. Raghavan says preliminary studies by his group show that the home-grown molecule gets better results than the one approved by the FDA in terms of elimination of cancer cells. And, it does so in significantly smaller doses, reducing further the chances of side effects. “The smaller size of the Disarib molecule, compared with ABT199, makes it easier for the drug to reach the cancerous cells where it can begin destroying the tumour,” adds his colleague Supriya Vartak. The results have been published in Biochemical Pharmacology. Following a number of preliminary tests and analyses, the drug was tested in cancer cell lines, animal models, patient samples and more. The team even utilised a humanised model of tumour in mice for ovarian carcinoma, in addition to three independent mouse tumour models for investigating the tumour regression property of Disarib. The molecule was found effective against a range of cancers — leukaemia, lymphoma, breast cancer, ovarian cancer and colon cancer. “In all the cases, our molecule performed better than ABT199, which is why we decided to patent this molecule,” said Prof. Raghavan. Pharmaceutical companies have shown some interest, which is very encouraging, says Prof. Raghavan, though he cautions that results of the study approved by the DBT will decide when the drug will be available in the market. The group has developed other inhibitors, too, some synthesised in the lab and some extracted from plants, and they will be tested as part of the new project though they are not as effective as Disarib.